Often seen as a glimpse into Southeast Asia before it became touristy, Myanmar (Burma) hasn’t quite made it into the standard backpacker loop yet. That is rapidly changing, however, with loosening visa regulations and a government slowly becoming more open and tolerant. For now, travel in Myanmar is still decidedly less touristy than the rest of Southeast Asia, but that doesn’t mean that it lacks tourist facilities and some of the annoyances that go along with them. Once you get off the tourist trail, things become much rougher and, many will say, much more ‘real’. Read about my trip to Indawgyi Lake for an example. The best time to visit Myanmar is from November to February, when the temperatures are more bearable and it rains the least. March to May is the hot season. During this time temperatures in most of the country can reach 40ºC or higher. The southwest monsoon usually begins around the end of May or the beginning of June and lasts until October. Frequent rains soak the country throughout this season. the embassy is open from 9am to noon and 1pm to 3pm—get there early as the lines can get long! if you need passport photos or you want to get a form in advance, a copy shop around the corner can help you. The tourist visa is valid for three months from the date of issue. 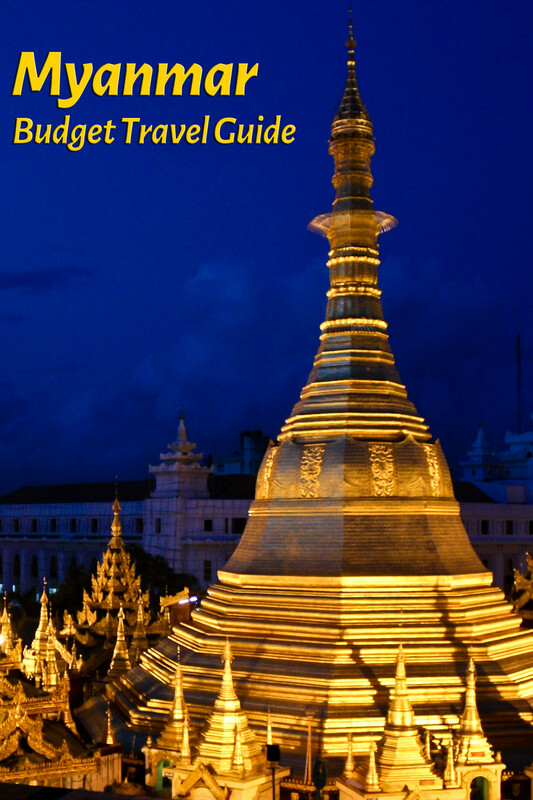 It allows you to be in Myanmar for 28 days. It can not be extended. The money situation in Myanmar can be a little problematic. There are no ATMs in the country and the only way to get money is with a credit card at a select few places (at a very high rate). Therefore, you basically have to bring in enough money to last your whole trip (Note: this appears to no longer be true, as Myanmar now has several ATMs and is constantly installing more; I am not sure how reliable the ATMs actually are though). Furthermore, that money needs to be in US dollars and those dollars need to be in perfect condition. Supposedly they must also be newer than 2006, but I had no problem using bills from after 2000 as long as they were in mint condition (Note: the requirement for perfect bills seems to have been relaxed somewhat, but I would play it safe and bring brand new ones anyway). Bring $100 dollar bills to change into the Burmese currency called Kyat. You will also need a lot of smaller bills to pay for entrance fees, taxis and cheaper hotels. In the past, the official rate was much lower than the black market rate, meaning the black market money changers were your best bet. Currently, banks offer similar rates to the black market, making them the preferred place to change money. You’ll want to change most of what you’ll need during your trip upon arriving in Yangon, as the rates are worse elsewhere in the country. At the same time, changing money back can be quite difficult, so you want to make sure not to exchange too much. When changing money, count carefully. You will have a lot of bills, so this could take a while. Don’t let them hurry you—take your time. After you have counted, don’t let anyone else touch the money. Some of the money changers have very quick hands and will lighten your pile of money if given the opportunity. If you like, you can read about my experience changing money on the black market in Yangon. Even with the government imposing relatively hefty surcharges on foreign tourists for accommodation, transportation and major attractions, Myanmar is quite cheap. If you stay in the cheapest accommodation, use the cheapest forms of transport, eat local food and don’t drink too much alcohol, you can keep your costs at around $10-$15 per day. I entered Myanmar with $500 and left 28 days later with money left over (this was in 2011). If you travel frugally, but comfortably, plan on spending $20 to $30 per day and you will easily have enough to get you through your trip. If you think you will be buying plane tickets to get around within the country, budget at least $100 per ticket. For first class train tickets budget $50. Your tickets will most likely be less than that, but it’s better to be safe. For now, all visitors to Myanmar must arrive by plane. It is possible to enter through a few land borders, but access is then restricted to those areas. Most visitors arrive in Yangon on flights from Bangkok or Singapore, but there are also some international flights into Mandalay. The cheapest and easiest option is probably an Air Asia flight from Bangkok. The main problem in traveling around Myanmar is that many areas are still off limits to foreigners. What areas exactly are off limits changes constantly. Your guesthouse should be able to inform you or at least guide you to someplace that can. Flying is the easiest, but also the most expensive option by far. Trains in Myanmar are ancient, slow, crowded, hot and generally pretty miserable over long distances. Over a short distance, they can be a wonderful cultural experience. Trains are relatively expensive as the government hits foreigners with a hefty surcharge. Buses in Myanmar range from comfortable, air-conditioned (i.e. freezing–bring something warm to wear) to some of the worst you’ll see. Luckily, you have many options for any popular routes and can basically pick your desired level of comfort. Buses are far and away the best way of getting around Myanmar, as the government doesn’t impose the same hefty surcharge as it does with train or plane tickets. In more rural areas, you will often be forced to rely on private cars or public jeeps. Both will try their best to overcharge you, so try to figure out what the locals are paying and don’t pay too much more. You will be hard pressed to get the same price, but I find paying a little more reasonable. Even with the recent increase in prices, you will still be able to find accommodation for under US $10 per night almost everywhere in Myanmar, except for more rural areas that see few tourists. The cheapest rooms will not be nice, though and you’ll have to do your searching once you’ve arrived in the country, because the cheapest places are not listed online. If you prefer to book ahead, Agoda (link to their Myanmar page) has a quite a few listings in all price ranges but the absolute lowest. I never booked ahead, but I did run into some difficulty in finding available rooms at times. The hotel shortage has only gotten worse, so you might want to consider arranging at least a night or two ahead of time in any new location, if you’d rather not deal with the added stress of having to find a room. Paying extra for an air-conditioned room may not be worth it, as all of Myanmar suffers from nightly power outages. Mid-range hotels will often have generators, but will not usually use them to run air conditioners. Only the larger, more expensive hotels will have an uninterrupted power supply. You should probably stay away from tap water and ice and stick to bottled water and boiled drinks like tea. If you want to drink alcohol, drink at local “beer stations” for a unique experience and large savings, but be prepared to be the center of attention—they do not see many, if any, foreign customers. Burmese food is a mixture of several cuisines (Chinese, Indian, various indigenous cuisines) and thus quite varied. A lot of it can be very oily though and many travelers complain about the food before too long. Street food usually costs $1 or less and fruit is very inexpensive as well. A meal in a standard restaurant will run you a few dollars and up to $10 in the most expensive places. Western food is available in all touristy areas. It is generally not very good (there are some exceptions, though) and overpriced. The crime rates are very low in Myanmar, since the government punishes crimes against tourists very harshly. Corruption also does not usually affect Westerners. There are some scams to be found in touristy areas, but far fewer and far less advanced than in neighboring Thailand. The biggest danger to tourists are generally the microbes. Food borne illness is very common and malaria and dengue fever are endemic. You will definitely want the standard vaccinations for travel around SE Asia (Hepatitis, Typhoid, etc.). The CDC website will have up to date health information for travelers to Burma. avoid hotel bars and clubs if you want to drink; visit local “beer stations” instead. Additional information on Myanmar can be found at the US Department of State website as well as the CIA World Factbook. My wife and I are in Myanmar right now as part of our 3 month honeymoon in the region and just found your site. You seem to have one of the few travel blogs with actual useful information so I thought I’d give you some updates. We got our Visa through Vientiane Laos and aside from the fact that you really had to work to get anybody’s attention it was super easy and cheap. Only $20 each and they got it to us next day since they were going to be closed 2 days from then. We’re here during the water festival which is fun for the first couple days but now we’ve been wet for 5 days (including a day in Chiang Mai) and are getting kind of sick of it. It wouldn’t be as bad if it weren’t for the fact that most businesses, including most restaurants, tour agencies and attractions are closed and it’s even harder to get a cab. Yangon was a madhouse and there’s nowhere outside your hotel room you can hope to stay dry but at least it mostly stops by 7PM. In Mandalay we’ve learned that as we walk we can look ahead down the road and if a section is wet all the way across we may want to walk on a different block if possible. Here it gets quieter but even at 10PM we still had locals occasionally pouring ice water on us. Hotels have definitely gotten expensive. In most cases you can’t get an air conditioned room on Agoda (only way to pay with credit card and avoid cash hassles) for under $40 and in April you need AC if you hope to sleep. Our hotel recommended one restaurant, Aye-Myit-Tar, that’s stayed open here and it’s really great. Non-stop free appetizers and tasty entrees and at the end they give you a little caramel flavored antacid that they just have buckets of on the tables. Congratulations on the wedding and I hope you’re enjoying your (3 month!) honeymoon! Thank you for the updated info on Myanmar. It’s been a few years since I was there and things are changing so fast in that country, so I know that, unfortunately, some of my information is out of date. That is especially true for hotel prices; I’m not surprised to hear that it’s difficult to find anything under $40 when booking online. On the plus side, at least there are a lot of options when booking ahead now. When I was there, you basically had to show up and hope for the best, but there were also far fewer tourists and only the most popular places filled up, so I never had issues getting a room. I am surprised to hear you were able to get a visa in Vientiane. I suppose it was only a matter of time before they extended that service beyond Bangkok, but I had not heard about that yet. Again, thank you for the info and enjoy Inle Lake! It was my favorite place in Myanmar. If you like wine, check out the Red Mountain Estate Winery. Wow. Just today I decided that I wanted to travel to Myanmar and I remember hearing about the lack of ATM’s so I decided to google this and I stumbled upon this post. This was incredibly informative. Thank you. The post is a few years old, though. I imagine there might be some ATMs in the country by now, given all the changes in the past few years. Great write up Daniel, very entertaining, and helpful, love those money saving tips you listed there. Thank you! Unfortunately, it’s probably a bit out of date by now. Things are changing so quickly in Myanmar.